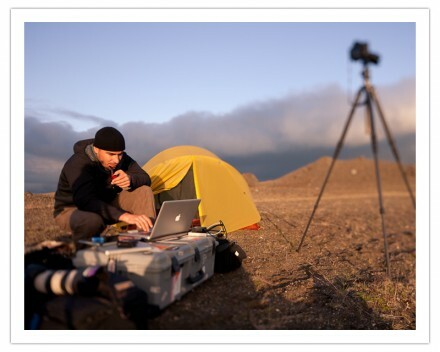 Dave Delnea downloading images in Iceland, 2010. There’s some great discussion going on in the comments of last Friday’s post, Backups Revisited. I think the topic of backups warrants some attention. We talk so much about lenses and tripods and, frankly, spend a lot of money on this art, that it’s insane not to spend some of that protecting our work. I laid out my current backup strategy in pretty simple terms, but there were questions about things I left on the periphery. Here’s some replies to those questions.. Yes, I have all my images in one Lightroom catalog. Over 125,000 of them. This has changed. I once had them in different catalogs for each year, but it was beginning to drive me insane with the need to open and close multiple catalogs for projects that spanned multiple years. All my files, in DNG format, are in one large LR catalog. When I travel I create a new catalog for the project, then import from catalog when I get home, and run the off-site backups, then do a proper color-managed edit on the big screen. While unrelated, my rating system is easy. An image is either a 5-star image or it’s not. Sure, I could use flagged as a pick instead, but this is how I do it. I’m just really binary in my decision making. It’s a Hell, Yes!, or a No. Lots of different systems out there, but I don’t think of my photographs relatively. Yes or No. And 5 star, for me, means yes. My offsite backups get updated either monthly or after a significant project. If I’ve not been shooting or doing serious editing for a month, then no need for the backups. My manager brings the Pelican to the office, we run the backup, he takes it home when he goes. I left the DROBO system because I was tired of the maintenance, the weird little glitches, and then the last updates gave me issues. It worked well when it worked, but I started getting nervous about the proprietary issues, so decided to go with a more traditional RAID this time. When I bought my last MacBook Pro, I had the service guy at the shop put in another 750GB drive after taking out the optical drive, which he put into an enclosure so I could use it as a USB optical drive if I needed to. Seemed easy enough. Added a little weight. I use the one drive – a hybrid drive – as my boot drive and it constantly backs up, using Time Machine, to the second drive. There’s some other good comments in the discussion, including the idea of using a service like Backblaze, which I don’t use, but see the advantage of. What I do use it DropBox for almost all my other files. All my business, writing, blog materials, it all goes on Dropbox so I can access it on every machine, and if one of my machines got stolen or destroyed, I could buy a new one sign into Dropbox and (after some waiting) have access to everything again as if nothing happened. Except my apps, of course, but I could download a trial version of anything important and get me through until I got home. Oh, and I can access that stuff on my iPhone and iPad through the Dropbox app too. The Cloud is magic. It’s like living in the future! I like your simple yes/no system for rating images. Being a professional I can see how this works. I know this isn’t the main focus of the thread, but do your libraries contain a mixture of “pro” and “personal” shots? 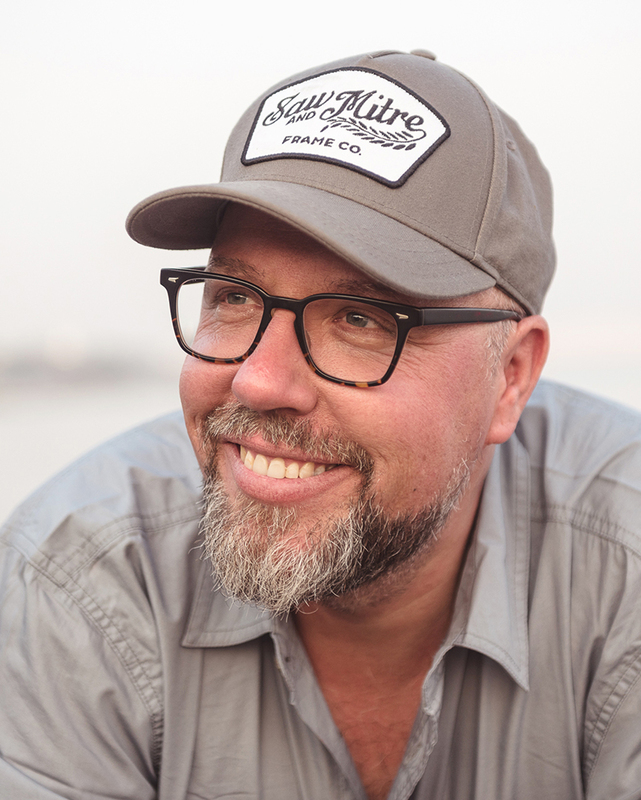 Being just a hobbyist, my libraries are full of “snapshots” and other things, like an interesting licence plate I caught with my iPhone or photos from my kids’ birthday parties, etc. I try to use star ratings to separate these different “types” of pictures. Managing such large amounts of photos – both personal family album stuff as well as more “creative” work is quite a challenge. It’s always good to know what methods other people are using. Now, I need to catch up on the backup thread because I would hate to lose any of it. Thanks again David for sharing and inspiring. I like the idea of one library. I use Aperture rather than LR , but in that regard it works the same way. Juggling libraries is a pain and it’s always possible to extract and create small temp libraries if necessary. Regards the comment from Richard, above, that’s how I handle snapshots. Pull it all into Aperture, export out all the snaps and then import them to an iPhoto library. I also use a RAID approach for the master backup as well as Carbonite to image a copy of the Dropbox that’s on my machine. When catastrophe strikes my issue won’ be having lost the work it will be “Where did I store the backup?” 🙂 I really like the swapped out optical drive – going to get that done this week. Thanks for all the tips! Love this site. hi David – great post as always. I was riveted by your first comment, as I was thinking just a couple of days ago about how sick I am opening and closing catalogues, trying to remember which year a particular image was taken, and where the $%^& it might be. However, what do you do about the fact that it takes quite a while to do a catalogue back -up, (no, I don’t do the ‘skip this time’ as i am pretty paranoid if I’ve made any changes at all). It takes a good hour to save metadata for the catalogue even with 300 photos (chosen with one star – mine aren’t as good as yours :-)) I can’t imagine if it had to trawl through 125,000 – calculation tells me well over 2 weeks!! and that is on the faster computer (2.8GHz i7 iMac with 16gb ram). How do you deal with that other than by “command save” and going off on a workshop? Best tip here. Print your best work. How will next gen see it otherwise? David, where do you store the prints you print large? I am sure your loft doesnt have the room for everything. Sarah it sounds like there are other issues at play with your LR backup speeds. I’ve got a single LR library with thousands of images running on a much older computer and the backup takes 3-5 minutes to complete. I wish I could be more helpful, but have a look at the way you’ve configured your setup and you should be able make significant speed improvements. PS. On a somewhat unrelated note, I use backblaze for my off-site backup and couldn’t be happier with them. Many of the same advantages as Dropbox in terms of file access from anywhere (not iPhone or iPad), and it’s very affordable. David, thinks for sharing your backup and archive process, buddy! The 2nd hard drive in the mac is brilliant. No delayed backups, no cables, no external drives! I use a g-drive mini 750 gig to store a 2nd copy of my work when i travel. When i’m done, I fedex it back to myself in a pelican 1020 case. This way, if I get separated from my computer, dropbox has my documents and the external has my photos and videos. Starting from Lightroom v4, I would consider merging the picts taken with a reflex with the one taken with an iPhone: it helps in copying geotag data. About backup I found super useful and efficient Crashplan, in addition to other methods already mentioned. My MacPro in studio is automatically and frequently updating the online encrypted backup. This is superb advice David. I know many folks who didn’t think seriously about their backup strategy until after a catastrophic loss. That’s a hard way to learn, much better to be prepared. drive in in my new computer. Printing your best images is the best!!! I started to print my best images, and putting them in folios. Then I store them flat on a large kitchen cart I got at IKEA that I use for my Epson 3880 printer. It’s got two shelves – one I use for papers, the other for print storage. 1) Better security. The encryption is done on your local machine rather than on their servers. 2) Flexibility. You can choose which individual files and folders are synced as opposed to having to put all the content in a Dropbox specific folder. With this flexibility comes a slightly “less simple” user interface. A question….doesn’t having all those images in one Lightroom directory slow down Lightroom when you are processing new images? Thanks for answering my question David. I will look into print storage like that. Your work, blog and the ability to share is truly inspiring to me to keep this thing we call a passion going. Please keep writing and taking pictures. I use Lightroom and keep a separate catalog for each camera. Also, I tend to shoot very few photos per outing/session so two 2TB drives has so far been more than enough storage. I keep one drive in house and one in my wife’s studio (which is detached from the house), just in case. I also use the “5 star” only rating system–it’s either in or out. And, it’s time to check out Dropbox! Thanks, David. Thanks so much for answering my question – we (read tech-wizard husband) are working on it. Just kind of assumed this was normal, so good to know that it’s not. I see a similar concern above re speed of lr processing if all images are in one catalogue. Looking forward to comments on that issue also. You’re welcome Sarah. Re the large volume of images in one catalog, in my experience it causes a little bit of extra time to launch LR when you’ve got all images in one place, but once loaded it doesn’t cause any slow-down. Having all the images in one place makes Smart Collections a lot more useful for me… the combination of camera metadata and my own keywords makes finding the images I want a doddle, rather than having to look through multiple catalogs. Thanks for the clarification as to speed, Daithi. I actually use Bridge more than LR, simple because it doesn’t “capture” my images and I can work on just one folder at a time, which allows me to use my own filing system, but if it doesn’t slow down LR that much, maybe I should go that way. I’m glad to see other people using one Lr catalog for all of their images. Good post. Thanks for the backup info.